For Tech Tuesday this week we are going to follow up on our announcement back in January about the new MakerBot Smart Extruder+. It was billed as being a major improvement over the previous Smart Extruder, but is it really? Well we received our order for two of them about a month ago, and have been working with it ever since. Now we are ready to share our findings and experience with you in this Makerbot Smart Extruder Review. The Smart Extruder in and of itself is unique in the 3D printing market. The entire extruder and filament feed system is detachable with strong magnets and a spring loaded electrical contact system that makes swapping out one extruder for another quick and easy. But this is not news as the interchangeable Smart Extruder has been in existence ever since the introduction of the MakerBot 5th Generation series of 3D Printers. For this MakerBot Smart Extruder Review we are focusing on what has changed between the old and new Smart Extruder + to improve its function and reliability. We also dissected one of them to search for physical evidence of significant improvements “under the hood.” Of course now I am sure I have just voided the warranty on it, but there is really no other way to determine what has been improved, other than using it. From a user experience perspective, so far so good. We have been using the new Smart Extruder+ constantly for a month. It works as expected, and from all appearances it is much improved. 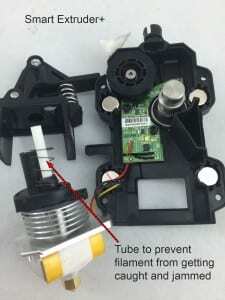 The biggest problem MakerBot users reported with the old Smart Extruder was filament jams. Sometimes it would happen while printing, but in my experience it happened most often when changing out the filament in the extruder. Opening the old Smart Extruder was not easy! 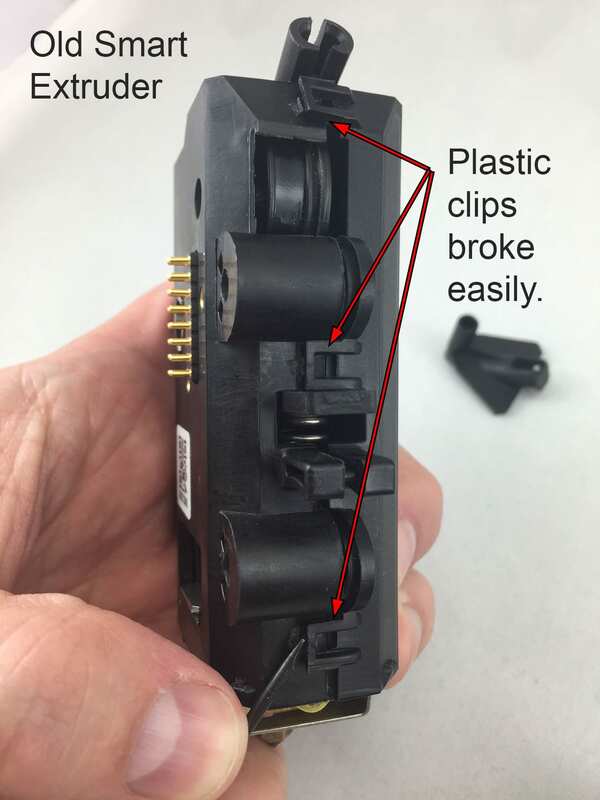 Often a little piece of filament would break off inside the Smart Extruder, get caught, and form an obstruction that prevented the loading of any more filament. The only options for a user were to install a new Smart Extruder, or take it apart and remove the little piece of filament. Very early on in my MakerBot experience I learned how to take the extruder apart to clear jams, but it was not easy. 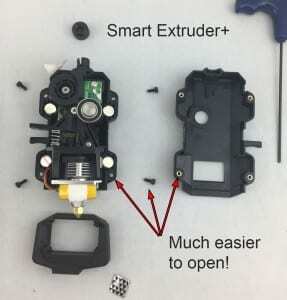 The old Smart Extruder has six plastic clips (three on each side) that you had to pry open with a very small screwdriver, very gently because they break easily, in order to separate the two halves of the plastic housing. It was especially tricky because you had to get one started, then start the next, then the third, sequentially back and forth until one side finally was completely separated, then you had to do the same with the other side. Inevitably several of the tabs would break, making reassembly difficult. I have been through about a dozen Smart Extruders in a couple years of use, and I was scrounging plastic covers with good tabs to keep running as needed. So here is the first advancement of the Smart Extruder+ that is visually apparent, and I am really pleased. They are now using four socket head cap screws to join the two halves of the housing together, and a simple allen wrench is all that is needed to remove them. They also made this connection very strong by using brass threaded inserts on one side, so that you are not screwing metal screws into plastic, well done MakerBot! 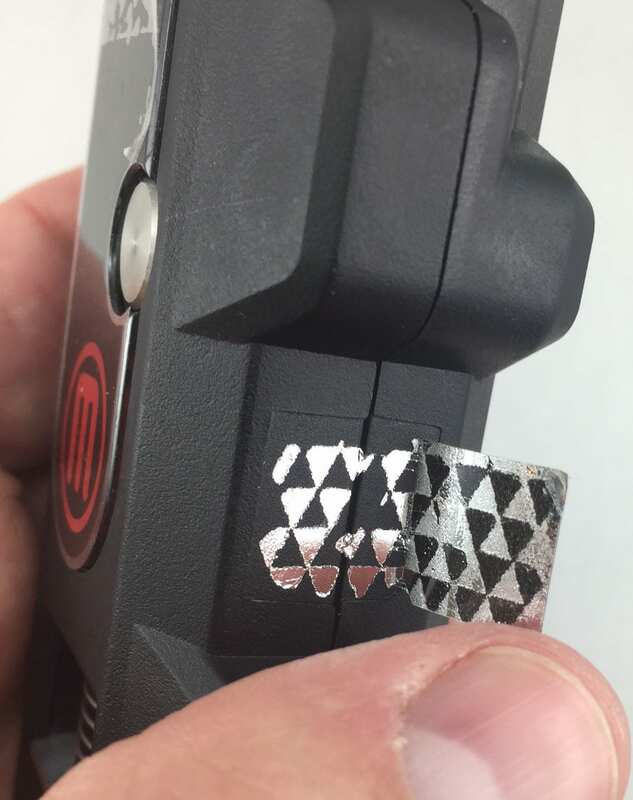 I also had to remove a tamper seal (sticker) that is clearly meant to prove if the Smart Extruder has ever been opened, because once you remove it, it is impossible to get it back in the exact same position. So there will be no hiding the fact that I have opened one of mine, so much for the warranty! I am actually ok with that, I would rather learn how to help myself when I need to than rely on sending the part back for repair or replacement. Tamper seal had to be broken , so much for my warranty! Once I got inside and disassembled the parts, it was clear to me that this new Smart Extruder+ is in fact a major improvement. To set this up, I just want to point out one of the key factors that has always distinguished the Smart Extruder. Every 3D printer has a hot end with a nozzle from which the plastic is dispensed, commonly called “the extruder.” They also all have a motor and a drive gear that feeds the filament into the extruder. Most 3D printers separate that motor and drive gear from the extruder, and push the filament through a plastic tube into the extruder from a significant distance away. This delivery system (called a Bowden system) does work for many 3D printers, but after testing and reviewing many of them, I have come to believe that the distance makes it harder to control the flow of plastic. Pushing the filament inevitably seems to cause more problems than pulling it does. 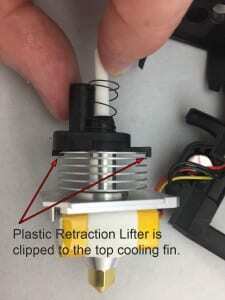 Fewer 3D printers place the filament drive motor directly above the extruder, including the MakerBot 5th Generation printers which use the Smart Extruder. While this structure does provide for better filament flow control, the added weight of the motor moving around the X and Y axes slows down the maximum travel speed of the extruder, lengthening the amount of time it takes to complete a print. There are always trade offs with features of 3D printers, and this is why we often say on WTFFF?! that the question is not “What is the best printer to buy?” but rather “What is the best printer for what I want to print?” I have come to appreciate more accurate higher quality prints, and am willing to sacrifice print speed for that quality. Others may prefer the increased speed of a Bowden 3D printer, and accept the resulting quality differences. So the Smart Extruder is not just an extruder, it also contains the filament drive motor and gear, among other features. Makerbot has not changed the filament drive motor or gear, but the gear presses the filament against a plastic wheel in order to grip it, I am calling this part the Filament Guide Wheel. Here is where I found the second significant change. 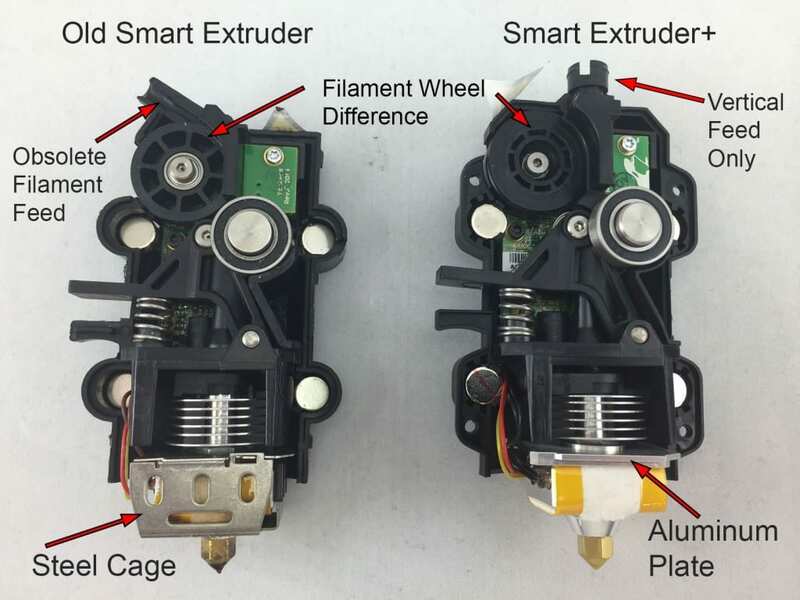 The old Smart Extruder has a hard plastic Filament Guide Wheel , but the Smart Extruder+ has a new Filament Guide Wheel with a molded rubber ring. 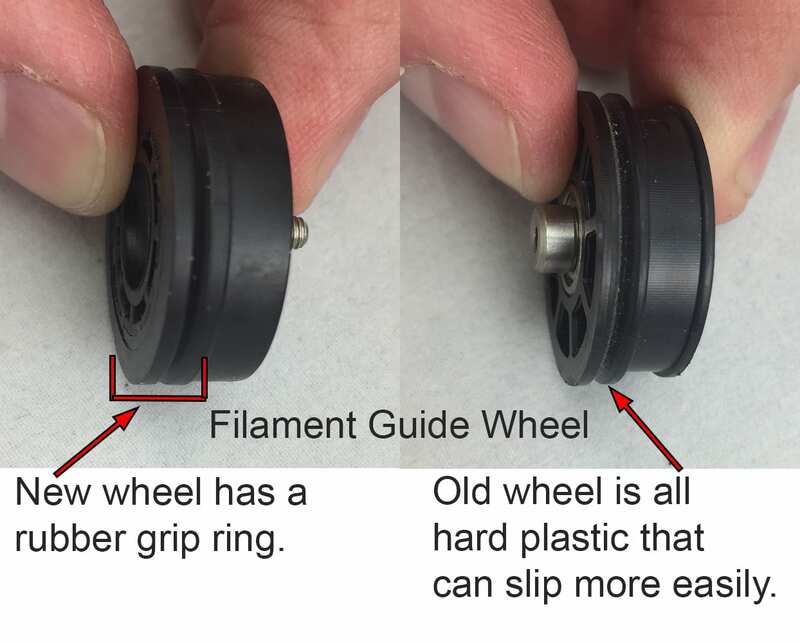 This change makes sense to me because filament is hard, smooth, and slippery, so I can see how the hard plastic wheel may have contributed to filament slipping and mis-feeding. I see the rubber ring providing a dual benefit of compressing if the filament you are using is slightly oversized. Without the rubber ring the gear can cut into the filament so much that it creates a divit (called a mouse bite) instead of moving the filament. Most other 3D printers I have experienced have a smooth metal Filament Guide Wheel, which would logically have the same slip issues that the hard plastic one did. I am surprised that more 3D printers have not adopted some kind of rubber grip wheel for the filament feed system. As I mentioned above, the biggest cause of filament jams with the old Smart Extruder for me was when I changed filament. 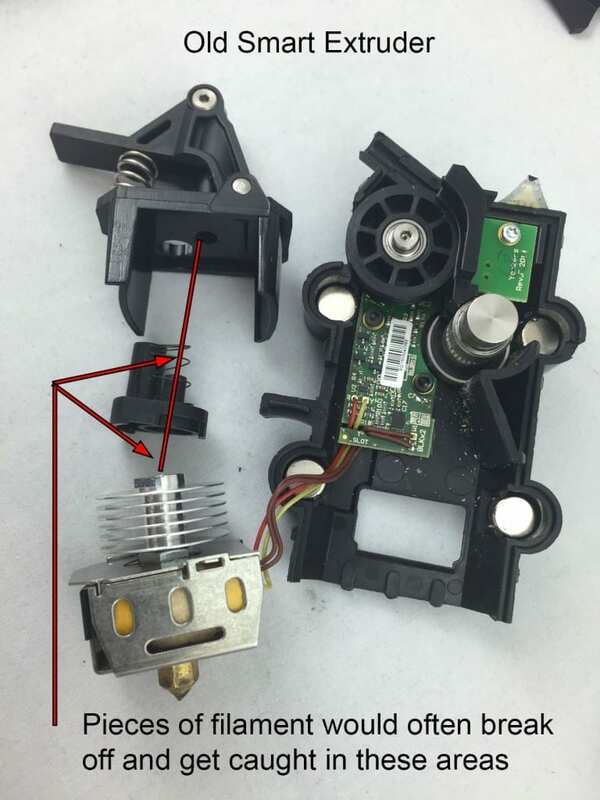 When the filament is unloaded, often times a very small piece of filament breaks off and is unable to be removed from the Smart Extruder. It frequently became an obstruction, preventing a new filament from being loaded. The problem was not as much about the piece of filament, but the fact that there was so much open space for the piece of filament to move and rotate, get caught in a spring or other internal parts. The best physical improvement in the Smart Extruder+ solves this problem. It is the addition of a high temperature plastic tube that contains and guides the filament down through the center of the assembly and into the heat block and nozzle. I think it is made of Teflon or some similar plastic, and eliminates the possibility of any stray filament fragments getting caught or rotating to block the path of the next filament to be used. Instead, if there is a piece of filament left behind it would just get pushed into the extruder and out the nozzle when the next filament is loaded. Another significant change is in the retraction function of the Smart Extruder +. There is a plastic part that contains a magnet, and its function is to lift up the entire nozzle assembly a very small distance, as needed. In the old Smart Extruder this part existed too, but it was free to separate from the extruder. Now MakerBot has changed this plastic part to mechanically clip it to the top cooling fin of the extruder assembly. This should make the retraction function perform better, because it will not be possible for one part to move without the other. The last physical difference is how the Heat Block and Nozzle are mounted to the assembly. The old Smart Extruder used a thin steel cage wrapped around the heat block to mount it to the plastic housing. The Smart Extruder+ has done away with that metal cage, and replaced it with a flat aluminum plate just above the heat block. The aluminum plate provides the same mounting function, just in a different way. I do not see a particular advantage of one over the other, they both seem to function in the same way. Perhaps it was a cost saving change, or there is some other benefit that is not visually apparent. 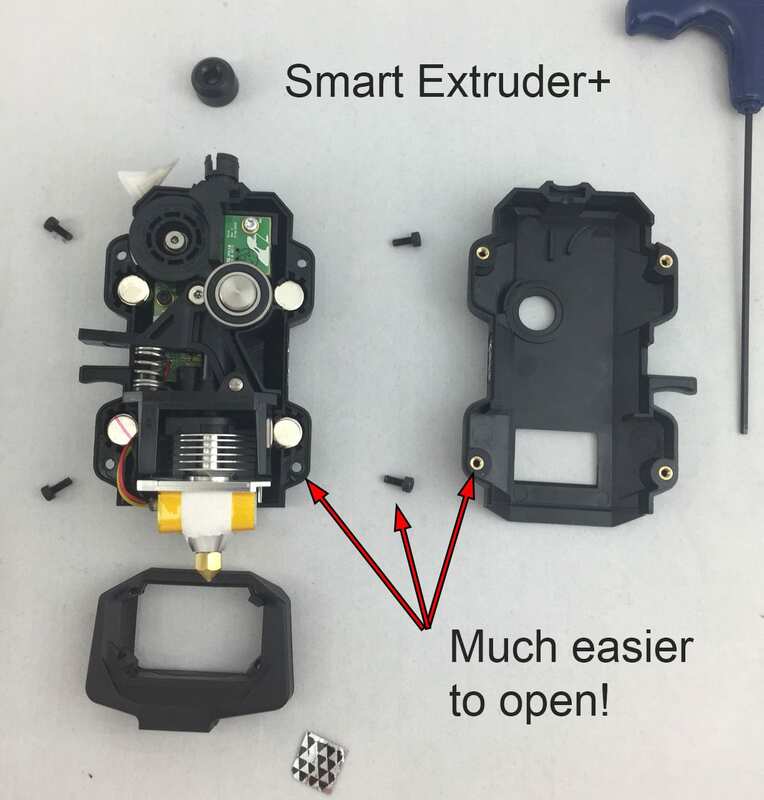 The Smart Extruder+ is more than just a prettier housing, it has many improvements “under the hood” that have improved the performance of this critical 3d printing component. I have not experienced any filament jams to date, and I can see that I am going to have a lot less down time with my printer. MakerBot claims that the new Smart Extruder should last for well over 1000 hours of printing time, and that test units in their lab have exceeded 1700 hours and are still going strong. Based on my past experience with the old Smart Extruder and my limited experience with the Smart Extruder +, I have no reason to doubt those numbers. I also expect that MakerBot has made improvements to the circuitry and software that drives the Smart Extruder+. However, I am not going to dissect it enough to try to identify the chips used , I am pretty good, but I am not that technical! I’m a middle school teacher and have 3 Makerbot Minis. I’ve had 5 not-so-Smart extruders and 4 of them have failed due to filament jams. Your article made me feel much better about going with Makerbot. I’m a long time fan of the Replicator 2 and it’s good to see that they are iterating their asses off to do this right. The analysis you did is a huge help giving me the information I need to salvage some of the failed units. Much obliged !